In traditional Chinese culture, the lot of a deaf child could be tragic—but John Yeh and his younger sister Fanny were blessed—they were born into a family that cherished and encouraged them. Yu Yeh, a civil engineer, and his wife Lin had fled mainland China in 1945, before the 1949 Communist takeover. John and Fanny had three older brothers—James, Jeffrey, and Joseph—all of whom would later play important roles in John's career, as did Fanny. Seeking better educational opportunities for their children, the Yehs emigrated from Hong Kong to Brazil, then to the U.S. John and Fanny were enrolled at KDES. He learned English from scratch. Three years later, he graduated with the other 18-year-olds. At Gallaudet College, John founded the Rathskeller, for many years a favorite student hangout. He also met and married Marry Gibbs, a teacher. They have two daughters—Mei Ling-Hui (Deaf), Ming Hui-Chung (who has Down's syndrome)—and a son, Jason Tai-Wei (Deaf). When John graduated from Gallaudet College in 1971, his original ambition was to teach high-school math, but he kept getting turned down. Sometimes he was told it was his English, other times he was told because he was deaf. He enrolled in the Master's program in Computer Science at University of Maryland, its first and only deaf student. He had to make his own arrangements for interpreters and notetakers, and worked very hard. He earned his Master's degree in Computer science in 1973, and then became a U.S. citizen. Unable to find a job, he reluctantly returned to Gallaudet, working as a computer programmer. His brothers were all thriving in the newly-flourishing computer field. He finally decided to start his own company, developing and selling software. He asked his brothers for assistance. In 1979, after some considerable financial struggle, John managed to obtain a small SBA loan and, in partnership with his brothers, founded Integrated Microcomputer Systems., based in Rockville, Maryland. They started off on a shoestring—but by 1985, they had to find larger quarters. By 1991, IMS had more than 400 employees. Clients included governmental agencies, commercial, and international clients. IMS was noted for its comfortable, inclusive, Deaf-friendly, and diverse environment. Even though he was now wealthy, John continued living in the same housing development with his parents and brothers. His office door was open to all employees. In 1996, IMS was sold to CACI International, the large info-tech corporation. 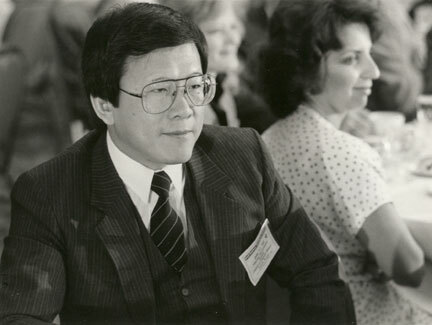 John founded the National Asian Deaf Congress, and was involved in a variety of business ventures. He also joined Gallaudet University's Board of Trustees, serving for 12 years—the first Deaf Asian-American Board member. In 2001, he founded Viable Technologies, proving CART (computer-assisted real-time transcription) services for deaf college students. In 2006, he founded Viable, Inc., a telecommunications company. It offers ViableVRS (remote video-relay interpreting services), Viable Vision (downloadable videophone), and unveiled its newest product, the VPAD, the first wireless videophone, this past January. Two of John's brothers are involved with Viable, as are Mei and Jason. (Ming lives nearby, and works in a hospital.) Notably, the majority of Viable's employees are deaf and hard-of-hearing, including several Gallaudet University and NTID/RIT alumni. Although he notes that Deaf Asian-Americans tend to be "traditionalistic," he sees opportunities opening up—and he's pleased to have had the chance to turn his earlier frustrations and struggles into "a positive contribution."